PT Wijaya Karya Industri Energi - WINNER or known as WIKA Energi is a rapid growing company in Indonesia, running business in renewable energy industry. WIKA Energi has main core business competencies on the development of energy conversion. WIKA Energi running business in solar heating industry, and other energy conversion products. 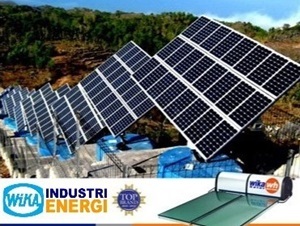 WIKA Energi engaged in developing various products based on solar energy and energy saving such as Solar Water Heater, Aircon Water Heater, Heat Pump Water Heater, Electric Water Heater, Solar Pool Heating and also various products based on Solar Panels such as Solar Home System, Solar Pumping System, Solar Street Light System, Solar Centralized Hybrid System, Solar Module / Panel. PT Wijaya Karya Industri Energi is a member of state-owned construction giant, PT Wijaya Karya (Persero) Tbk (WIKA Group). PT Wijaya Karya Industri Energi was formed in 2013 and previously known as PT WIKA Intrade Energi. According to information found in WIKA Energi's website as cited by JobsCDC.com, WIKA Energi is based in Jakarta and its head office is registered at WIKA Building 7th floor - Jl DI Panjaitan Kav 9 Jakarta 13340. WIKA Energi now has 1 production facility located at Kompleks Perindustri WIKA Bogor (KIW-Bogor) - Jl Raya Narogong Km 26, Cileungsi, Bogor 16820. S1 Civil Engineering, Accounting (1). The candidates with prior experience in battery or LED lamp industry (5). Willing to be placed in WIKA Industrial Area Bogor. JobsCDC.com now available on android device. Download now on Google Play here. Please be aware of recruitment fraud. The entire stage of this selection process is free of charge. 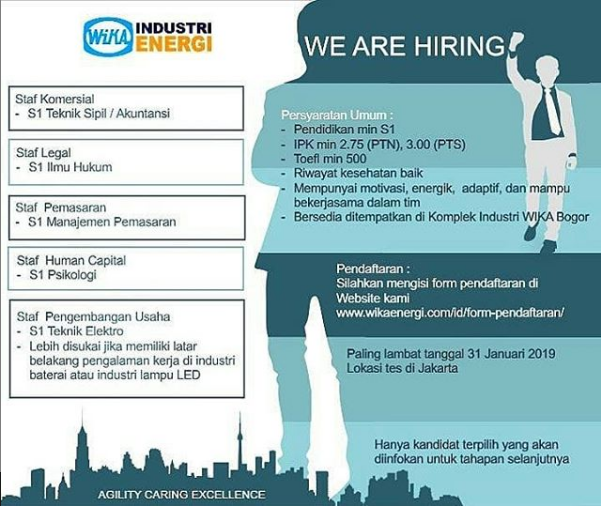 PT Wijaya Karya Industri Energi - Fresh Garduate, Experienced Staff WIKA Group January 2019 will never ask for fees or upfront payments for any purposes during the recruitment process such as transportation and accommodation.